Overview of Microsoft StaffHub – Share your feature requests and ideas for improving Microsoft StaffHub. The feature teams working on StaffHub regularly review the ideas you submit, incorporating them into their work to make your experience even better. Microsoft StaffHub is a cloud-based platform designed for employees whose job requires them to be on their feet or on the go. Examples include baristas, hair stylists, waiters, bus drivers, and so on. StaffHub helps you create and manage work shifts, share files, and communicate important information with team members. It's available to Office 365 for business subscribers and comes with a web app for managers and mobile app for employees. The mobile app supports both iOS and Android. Managers use the StaffHub web app to create schedules, manage requests for shift swaps or time off, and share information with the team. 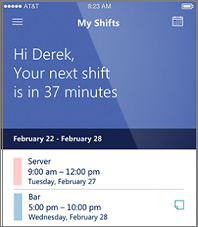 Employees use the mobile app to view their shifts, submit shift and time-off requests, and communicate with the team. Make sure you have an Office 365 for business license. Sign in to StaffHub with your work account (see How to sign in or out of Microsoft StaffHub for instructions). Enter the name, phone number, and other information for each of your employees. Send an invitation to each employee so they can download the app and see their schedules. Employees will need their work account to sign in to the app. Some of my employees are vendors and don't have Office 365 accounts. Can I schedule them through StaffHub? No. Everyone has to have an Office 365 account with your company in order to use the apps. Does StaffHub use Office 365 Groups? Yes. Every time a manager creates a team in StaffHub, the app auto-provisions an Office 365 group. It adds all of the team members to the group. By default Office 365 Groups is enabled for a tenant, and everyone has permissions to create groups. If you've changed these defaults for your organization, use PowerShell to re-enable Groups, and give managers permissions to "send as" the Office 365 group.